It's a difficult nation and for us western relatively dangerous because of the rooted Islamic fundamentalism strongly. However the northern part of the country, that overlooking the coasts of the Mediterranean, are very beautiful and the casbah in Algiers perhaps represents the most fascinating example in Arabic city. The nation is enormous (it is the second in Africa after Sudan) and to a large extent desert. But here the Sahara reaches the maximum shines: the central oases, especially in the Ghardaia area and the thick one of the Hoggar, among pinnacles, rocks and sand, they are worth alone the trip. 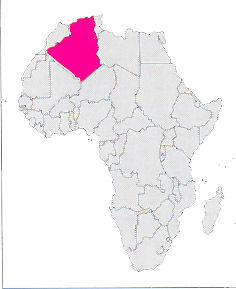 Nevertheless the most spectacular part of the Sahara is ubicated at south - east of Tassili n'Ajjer, in the Tadrart, between the Djanet oasi and the libian border.